For other uses, see Itch (disambiguation). Itch (also known as pruritus) is a sensation that causes the desire or reflex to scratch. Itch has resisted many attempts to classify it as any one type of sensory experience. Itch has many similarities to pain, and while both are unpleasant sensory experiences, their behavioral response patterns are different. Pain creates a withdrawal reflex, whereas itch leads to a scratch reflex. Unmyelinated nerve fibers for itch and pain both originate in the skin; however, information for them is conveyed centrally in two distinct systems that both use the same nerve bundle and spinothalamic tract. Pain and itch have very different behavioral response patterns. Pain evokes a withdrawal reflex, which leads to retraction and therefore a reaction trying to protect an endangered part of the body. Itch in contrast creates a scratch reflex, which draws one to the affected skin site. Itch generates stimulus of a foreign object underneath or upon the skin and also the urge to remove it. For example, responding to a local itch sensation is an effective way to remove insects from one's skin. Scratching has traditionally been regarded as a way to relieve oneself by reducing the annoying itch sensation. However, there are hedonic aspects of scratching, as one would find noxious scratching highly pleasurable. This can be problematic with chronic itch patients, such as ones with atopic dermatitis, who may scratch affected spots until they no longer produce a pleasant or painful sensation, instead of when the itch sensation disappears. It has been hypothesized that motivational aspects of scratching include the frontal brain areas of reward and decision making. These aspects might therefore contribute to the compulsive nature of itch and scratching. Events of "contagious itch" are very common occurrences. Even a discussion on the topic of itch can give one the desire to scratch. Itch is likely to be more than a localized phenomenon in the place we scratch. Results from a study showed that itching and scratching were induced purely by visual stimuli in a public lecture on itching. The sensation of pain can also be induced in a similar fashion, often by listening to a description of an injury, or viewing an injury itself. There is little detailed data on central activation for contagious itching, but it is hypothesized that a human mirror neuron system exists in which we imitate certain motor actions when we view others performing the same action. A similar phenomenon in which mirror neurons are used to explain the cause is contagious yawning. The sensation of itch can be reduced by many painful sensations. Studies done in the last decade have shown that itch can be inhibited by many other forms of painful stimuli, such as noxious heat, physical rubbing/scratching, noxious chemicals, and electric shock. Scabies is one cause of itching. Allergic reaction to contact with specific chemicals, such as urushiol, derived from poison ivy or poison oak, or Balsam of Peru, found in many foods and fragrances. Certain allergens may be diagnosed in a patch test. 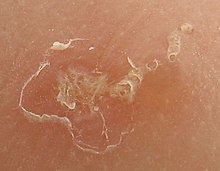 Foreign objects on the skin are the most common cause of non-pathological itching. Skin conditions (such as psoriasis, eczema, seborrhoeic dermatitis, sunburn, athlete's foot, and hidradenitis suppurativa). Most are of an inflammatory nature. Itch originating in the skin is known as pruritoceptive, and can be induced by a variety of stimuli, including mechanical, chemical, thermal, and electrical stimulation. The primary afferent neurons responsible for histamine-induced itch are unmyelinated C-fibres. Two major classes of human C-fibre nociceptors exist: mechano-responsive nociceptors and mechano-insensitive nociceptors. Mechano-responsive nociceptors have been shown in studies to respond to mostly pain, and mechano-insensitive receptors respond mostly to itch induced by histamine. However, it does not explain mechanically induced itch or when itch is produced without a flare reaction which involves no histamine. Therefore, it is possible that pruritoceptive nerve fibres have different classes of fibres, which is unclear in current research. Studies have been done to show that itch receptors are found only on the top two skin layers, the epidermis and the epidermal/dermal transition layers. Shelley and Arthur had verified the depth by injecting individual itch powder spicules (Mucuna pruriens), and found that maximal sensitivity was found at the basal cell layer or the innermost layer of the epidermis. Surgical removal of those skin layers removed the ability for a patient to perceive itch. Itch is never felt in muscle or joints, which strongly suggests that deep tissue probably does not contain itch signaling apparatuses. Sensitivity to pruritic stimuli is evenly distributed across the skin, and has a clear spot distribution with similar density to that of pain. The different substances that elicit itch upon intracutaneous injection (injection within the skin) elicit only pain when injected subcutaneously (beneath the skin). Itch is readily abolished in skin areas treated with nociceptor excitotoxin capsaicin, but remains unchanged in skin areas which were rendered touch-insensitive by pretreatment with saponins, an anti-inflammatory agent. Although experimentally induced itch can still be perceived under a complete A-fiber conduction block, it is significantly diminished. Overall, itch sensation is mediated by A-delta and C nociceptors located in the uppermost layer of the skin. Neuropathic itch can originate at any point along the afferent pathway as a result of damage of the nervous system. They could include diseases or disorders in the central nervous system or peripheral nervous system. Examples of neuropathic itch in origin are notalgia paresthetica, brachioradial pruritus, brain tumors, multiple sclerosis, peripheral neuropathy, and nerve irritation. Neurogenic itch, which is itch induced centrally but with no neural damage, is mostly associated with increased accumulation of exogenous opioids and possibly synthetic opioids. Itch is also associated with some symptoms of psychiatric disorders such as tactile hallucinations, delusions of parasitosis, or obsessive-compulsive disorders (as in OCD-related neurotic scratching). Inflammatory mediators—such as bradykinin, serotonin (5-HT) and prostaglandins—released during a painful or pruritic inflammatory condition not only activate pruriceptors but also cause acute sensitization of the nociceptors. In addition, expression of neuro growth factors (NGF) can cause structural changes in nociceptors, such as sprouting. NGF is high in injured or inflamed tissue. Increased NGF is also found in atopic dermatitis, a hereditary and non-contagious skin disease with chronic inflammation. NGF is known to up-regulate neuropeptides, especially substance P. Substance P has been found to have an important role in inducing pain; however, there is no confirmation that substance P directly causes acute sensitization. Instead, substance P may contribute to itch by increasing neuronal sensitization and may affect release of mast cells, which contain many granules rich in histamine, during long-term interaction. Crotamiton (trade name Eurax) is an antipruritic agent available as a cream or lotion, often used to treat scabies. Its mechanism of action remains unknown. Sometimes scratching relieves isolated itches, hence the existence of devices such as the back scratcher. Often, however, scratching can intensify itching and even cause further damage to the skin, dubbed the "itch-scratch-itch cycle." In 1660, German physician Samuel Hafenreffer defined itch. Approximately 280 million people globally, 4% of the population, have difficulty with itchiness. This is comparable to the 2–3% of the population suffering from psoriasis. ^ a b c Andersen HH, Elberling J, Arendt-Nielsen L (2015). "Human surrogate models of histaminergic and non-histaminergic itch" (PDF). Acta Dermato-Venereologica. 95 (7): 771–7. doi:10.2340/00015555-2146. PMID 26015312. ^ a b c d e f g Ikoma A, Steinhoff M, Ständer S, Yosipovitch G, Schmelz M (2006). "The neurobiology of itch". Nat. Rev. Neurosci. 7 (7): 535–47. doi:10.1038/nrn1950. PMID 16791143. ^ Greaves MW, Khalifa N (2004). "Itch: more than skin deep". Int. Arch. Allergy Immunol. 135 (2): 166–72. doi:10.1159/000080898. PMID 15375326. ^ Karsak, M.; Gaffal, E.; Date, R.; Wang-Eckhardt, L.; Rehnelt, J.; Petrosino, S.; Starowicz, K.; Steuder, R.; et al. (2007). "Attenuation of allergic contact dermatitis through the endocannabinoid system". Science. 316 (5830): 1494–7. Bibcode:2007Sci...316.1494K. doi:10.1126/science.1142265. PMID 17556587. ^ Yosipovich, G; Fast, K; Bernhard, JD (December 2005). "Noxious heat and scratching decrease histamine-induced itch and skin blood flow". Journal of Investigative Dermatology. 125 (6): 1268–1272. doi:10.1111/j.0022-202X.2005.23942.x. PMID 16354198. Retrieved June 4, 2016. ^ Ward, L; Wright, E; McMahon, SD (Jan 1996). "A comparison of the effects of noxious and innocuous counterstimuli on experimentally induced itch and pain". Pain. 64 (1): 129, 138. doi:10.1016/0304-3959(95)00080-1. PMID 8867255. ^ Pfützner, Wolfgang; Thomas, Peter; Niedermeier, Andrea; Pfeiffer, Christiane; Sander, Christian; Przybilla, Bernhard (2003-02-20). "Systemic Contact Dermatitis Elicited by Oral Intake of Balsam of Peru". Acta Dermato-Venereologica. 83 (4): 294. doi:10.1080/00015550310016599. PMID 12926805. ^ "Diagnosis and Management of Contact Dermatitis". Aafp.org. Retrieved 2014-04-09. ^ Byers, Jerry P. (2006). Metalworking Fluids, Second Edition. CRC Press. ISBN 142001773X. ^ Feingold, Ben F. (1973). Introduction to clinical allergy. the University of Michigan. ISBN 0398027978. ^ a b Botero F. (1978). "Pruritus as a manifestation of systemic disorders". Cutis; cutaneous medicine for the practitioner. 21 (6): 873–80. PMID 657843. ^ Yosipovitch G, Greaves MW, Schmelz M (2003). "Itch". Lancet. 361 (9358): 690–4. doi:10.1016/S0140-6736(03)12570-6. PMID 12606187. ^ a b c d Twycross, R.; Greaves, MW; Handwerker, H; Jones, EA; Libretto, SE; Szepietowski, JC; Zylicz, Z (2003). "Itch: scratching more than the surface". QJM. 96 (1): 7–26. doi:10.1093/qjmed/hcg002. PMID 12509645. ^ Schmelz M, Schmidt R, Bickel A, Handwerker HO, Torebjörk HE (1997). "Specific C-receptors for itch in human skin". J. Neurosci. 17 (20): 8003–8. PMID 9315918. ^ Bernhard JD (2005). "Itch and pruritus: what are they, and how should itches be classified?". Dermatol Ther. 18 (4): 288–91. doi:10.1111/j.1529-8019.2005.00040.x. PMID 16296999. ^ Rukwied R, Lischetzki G, McGlone F, Heyer G, Schmelz M (2000). "Mast cell mediators other than histamine induce pruritus in atopic dermatitis patients: a dermal microdialysis study". Br. J. Dermatol. 142 (6): 1114–20. doi:10.1046/j.1365-2133.2000.03535.x. PMID 10848733. ^ Hercogová J (2005). "Topical anti-itch therapy". Dermatologic therapy. 18 (4): 341–3. doi:10.1111/j.1529-8019.2005.00033.x. PMID 16297007. ^ Vos, T; Flaxman, Abraham D; Naghavi, Mohsen; Lozano, Rafael; Michaud, Catherine; Ezzati, Majid; Shibuya, Kenji; Salomon, Joshua A; et al. (Dec 15, 2012). "Years lived with disability (YLDs) for 1160 sequelae of 289 diseases and injuries 1990–2010: a systematic analysis for the Global Burden of Disease Study 2010". The Lancet. 380 (9859): 2163–96. doi:10.1016/S0140-6736(12)61729-2. PMID 23245607. Han, Liang; Dong, Xinzhong (6 May 2014). "Itch Mechanisms and Circuits". Annual Review of Biophysics. 43 (1): 331–355. doi:10.1146/annurev-biophys-051013-022826. PMC 4081479. Andrew D, Craig AD (2001). "Spinothalamic lamina I neurons selectively sensitive to histamine: a central neural pathway for itch". Nat. Neurosci. 4 (1): 72–7. doi:10.1038/82924. PMID 11135647. This page was last edited on 5 April 2019, at 22:37 (UTC).